I've Got My Ion You is a green magnetic polish with with golden green aurora shimmer and a gold to pink/red magnetic sheen. This shade is so stunning and mesmerizing! Shown is three coats plus top coat. Dime and Dash (I named this one!) 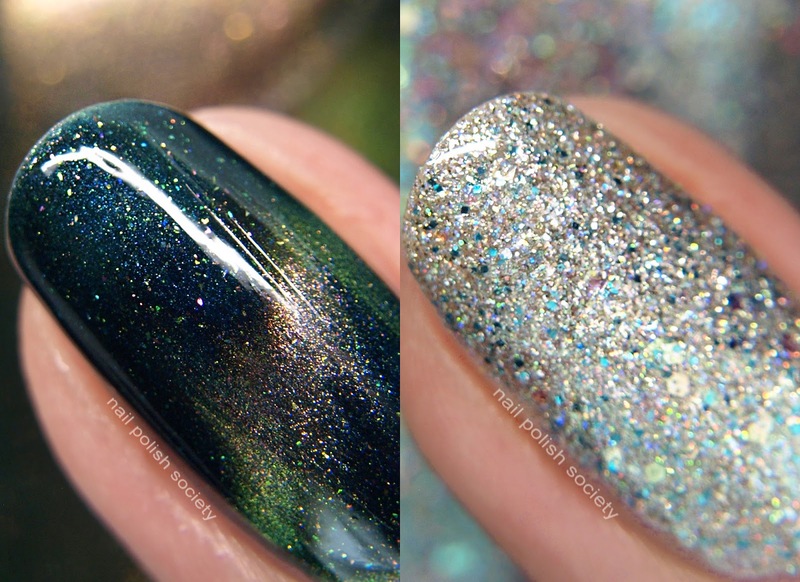 is a holo glitter bomb with color shifting glitters in orange, green, and blue, and blue metallic micro glitter. My photos never show holo well, but this one is SO sparkly! The glitter payout is really good and it builds up to opacity easily. Shown is three coats plus top coat. Both are available now through the end of August through the Girly Bits website.